Read Meridian's findings and learn about new market practices and trends that will inform best practices for the next year and beyond. 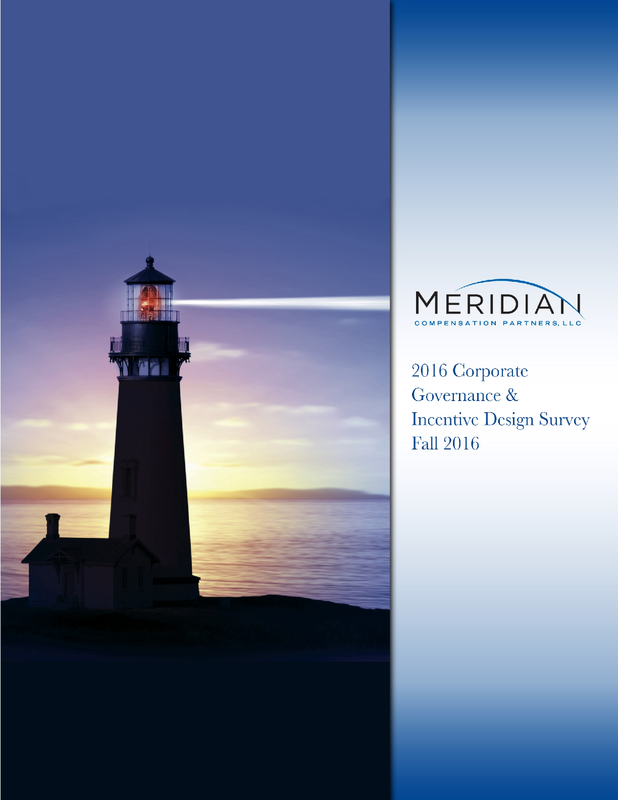 In order to inform these perspectives, Meridian’s 2016 Corporate Governance & Incentive Design Survey presents our findings on a variety of executive compensation and corporate governance topics facing companies today. Results are reflective of 250 large publicly traded companies across a variety of industries (the “Meridian 250”) with median revenues and market capitalization of $15.3B and $20.1B, respectively. All information was obtained from publicly disclosed documents. A similar analysis has been conducted annually since 2011, with minimal changes to the sample of companies (over 97% of the companies used in 2016 were also surveyed in 2015). See Profile of Survey Companies for more information on the survey sample. Combining the roles of CEO and Board Chair continues to be the slight majority practice, with 54% of companies choosing to combine these positions. More than one-half (57%) of the Meridian 250 disclose a mandatory retirement age in which a director may no longer stand for re-election. 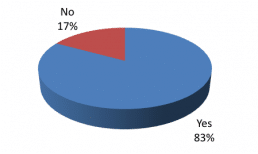 Nearly all such policies (95%) set the retirement age for directors between 72 and 75. The most prevalent and median age is 72. Nearly all of the Meridian 250 (95%) begin the Compensation Discussion and Analysis (CD&A) with an executive summary, typically three or more pages in length (66%), providing volitional disclosures in an effort to articulate business strategies and pay program alignment with performance. Over one-fourth (28%) of the Meridian 250 include a voluntary disclosure comparing company performance to Named Executive Officer (NEO) pay, with over one-half of these companies focusing on earned (realized) or projected to be earned (realizable) pay, rather than target or reported compensation. Nearly two-thirds (65%) of the Meridian 250 disclose shareholder outreach efforts in the CD&A, with a majority of these companies providing details on shareholder feedback and/or actions taken by the company in response to the feedback. For annual incentive plans, the most prevalent performance metrics continue to be Operating Income, Revenue, Earnings Per Share (EPS) and Cash Flow. Long-term performance-based vehicles (e.g., performance shares or units) are used at 94% of the Meridian 250 and continue to comprise more than 50% of the total long-term incentive (LTI) opportunity granted to the CEO and the other NEOs. Relative total shareholder return (TSR) continues to be the most prevalent metric used in performance-based LTI vehicles (57%); however, the predominant practice for companies using a relative TSR metric is to pair it with at least one additional performance metric (77%). What voting standard does the company employ for uncontested director elections? 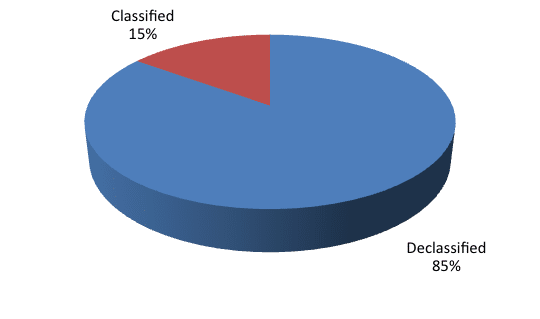 Is the board’s structure classified (i.e., director terms are staggered)? Does the company disclose the adoption of a proxy access bylaw? Meridian comment. A strong majority of the Meridian 250 employ what many observers consider to be hallmarks of leading corporate governance practices. This includes a majority voting standard for director elections, a mandatory resignation policy if directors fail to receive majority support and a declassified board structure. Since we began conducting the survey in 2011, the percentage of companies employing a majority voting standard has increased from 79% to 96%. For those companies employing a declassified board structure, the percentage has risen 67% to 85%. However, a small minority of companies (15%) still prefer a classified board structure, likely to prevent an activist or single issue shareholder from taking control of the board. Proxy access is the latest corporate governance practice to gain traction in the large cap market, largely driven by shareholder-led initiatives. Although still a minority practice among the Meridian 250, the number of companies implementing proxy access bylaws (38%) has risen significantly in the last two years and is expected to continue increasing in prevalence. Many companies are proactively adopting proxy access bylaws in anticipation of shareholder proposals or in response to strong shareholder support of the practice. Most of these adoptions require a shareholder to own more than 3% of the company for at least three years to take advantage of proxy access. Does the company disclose a mandatory retirement age policy for directors (i.e., an age at which directors cannot stand for re-election at the next annual meeting)? What is the tenure of the Meridian 250 independent directors? Meridian comment. A majority (57%) of the Meridian 250 disclose a mandatory retirement policy, up from 40% in 2013. Growing interest in the link between director tenure and independence by governance activists has likely driven the increase over the last three years. It is unclear, however, whether the increase is due to companies implementing new policies or disclosing existing ones for the first time. Of the companies with mandatory retirement policies, 95% have selected an age between 72 and 75. We expect board refreshment to be a focal point for many large institutional investors. Does the CEO also serve as Board Chair (CoB)? If not, is it the company’s policy to mandate the separation of the CEO and CoB role? If the CEO and CoB roles are separate, what is the CoB’s relationship to the company? 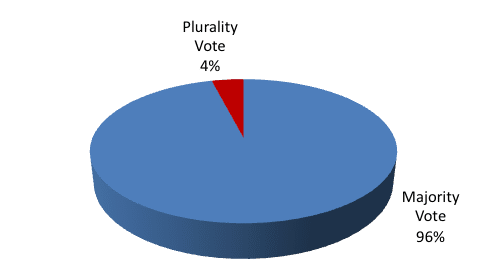 1 Incumbents may be included in multiple categories. 2 Founding family includes 2nd or 3rd generation members of the original founder. Meridian comment. Slightly over one-half of the Meridian 250 (54%) prefer a leadership structure where the CoB and CEO roles are combined, with one voice speaking for the company. Separating these roles can be advantageous, however, for companies going through a transition period or where a new CEO has little experience in the role and/or limited board experience. 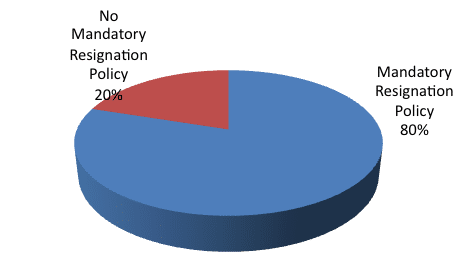 While 46% of companies separate the roles, a great majority of these companies (87%) do not have a policy that mandates such separation. In addition, a majority of the companies that separate the roles have elected a CoB who is an independent director with no prior executive relationship with the company (63%). Meridian comment. It is a near universal practice (99%) to designate a Lead Director if the roles of CoB and CEO are combined. The prevalence of a Lead Director has steadily increased from 88% in 2011, indicating that the establishment of formal board leadership roles has become a best practice. A non-rotating Lead Director role can provide considerable board leadership in the absence of a separate CoB. Nearly all of the Meridian 250 that designate a Lead Director provide additional fees to recognize the increased time commitment and responsibility of the role (90%). In our experience, the additional fees range from $25,000 to $35,000 and are typically calibrated with, or somewhat higher than, the Audit Committee Chair’s fees. Is an executive summary included at the beginning of the proxy statement and/or at the front of the CD&A? 1 Refers to a summary at the beginning of the proxy statement highlighting the key information throughout the disclosure, including all management and shareholder proposals. What is the length of the executive summary at the beginning of the CD&A? Meridian comment. Nearly all of the Meridian 250 provide some form of voluntary disclosure in their proxy statement. The most prevalent is an executive summary to the CD&A (95%), which has emerged as a best practice to articulate the details of compensation programs. Executive summaries typically include an overview of a company’s executive compensation program, recent changes to corporate governance or executive pay practices and volitional graphs or charts highlighting NEO pay levels and/or company performance. The increasing prevalence of supplemental disclosures in recent years has resulted in longer executive summaries, often stretching three or more pages in length (66%). A proxy summary is now provided by over one-half of the Meridian 250 (57%) and has nearly doubled in prevalence in the last three years (up from 29% in 2013). Proxy summaries may include a glimpse of the company’s business strategy, important pay messages, provide data on financial performance or outline key vote information. Approximately 94% of the Meridian 250 held a Say on Pay vote at their most recent shareholder meeting. Only 2% of the Meridian 250 failed their Say on Pay vote in 2016, with another 4% only receiving between 50%-70% shareholder support. In a continued effort to achieve high levels of shareholder support (currently averaging well over 90%), the Meridian 250 continue to provide comprehensive disclosures to describe and defend their executive compensation practices. Did the company provide information on shareholder engagement in the proxy statement? Meridian comment. Although shareholder outreach has historically been a common practice, companies are increasingly disclosing their shareholder engagement process in their proxy statements, highlighting efforts to communicate directly with their larger institutional investors on executive compensation and corporate governance topics throughout the year. Forty-two percent (42%) of the Meridian 250 provided details on the feedback received by shareholders and/or the specific actions the company has taken to address shareholder concerns. Explaining the communication efforts with institutional investors demonstrates a company’s responsiveness to shareholders and can provide a strong rationale for compensation program decisions. As such, we anticipate more companies will discuss their approach to shareholder engagement in future proxy statements, including details on how shareholder feedback helped drive compensation and corporate governance decisions. Absolute Performance—a disclosure solely depicting the company’s financial performance or stock price (i.e., no relative comparison). Relative Performance—a disclosure comparing the company’s financial performance or stock price to the financial performance or stock price of other companies. Does the company provide a disclosure regarding absolute company performance? Does the company provide a disclosure regarding relative company performance? Meridian comment. A strong majority of the Meridian 250 (85%) provide absolute company performance disclosures highlighting recent financial results and business achievements as a way to connect a company’s progress with compensation decisions. 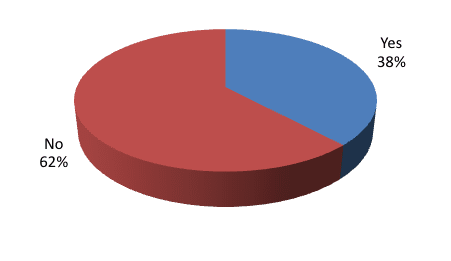 Most of these absolute performance disclosures (76%) focus on a performance period between one and three years. Relative performance disclosures are still a minority practice (44%), but have steadily increased in prevalence in recent years. These disclosures typically cover a longer period of time than absolute performance disclosures, with a majority (61%) covering a period between three and five years. Furthermore, relative performance is most often compared to one or more of the following groups: a broad industry index (66%), the compensation benchmarking peer group (50%) or an industry-specific index (31%). Over one-fourth of the Meridian 250 (28%) provide additional disclosures comparing NEO pay to company performance in an effort to show alignment. Does the company compare performance to one of the following forms of pay? 1 Sum of prevalence percentages exceeds 100% due to companies that show multiple forms of pay in their pay and performance disclosures. Meridian comment. While the Securities and Exchange Commission (SEC) has not yet issued final rules requiring companies to disclose the relationship between executive pay and company performance, 28% of the Meridian 250 voluntarily chose to provide some form of a pay and performance disclosure. This is likely in light of pressures from institutional shareholders and their advisors, and the desire to positively influence Say on Pay vote outcomes. While disclosures vary widely, realized/realizable pay continues to be the most prevalent pay definition used by the Meridian 250. In April 2015, the SEC released the proposed rule that will require public companies to disclose the relationship between executive compensation “actually paid” and the financial performance of the company, as mandated by the Dodd-Frank Wall Street Reform and Consumer Protection Act (“Dodd-Frank”). A year and a half later, the SEC still has not indicated when it is likely to issue final rules on the pay-for-performance disclosure requirement. However, we do not anticipate that this disclosure requirement will necessarily replace voluntary pay and performance disclosures. We expect that many companies will continue to make these voluntary disclosures as a supplement to the required disclosure, further articulating their pay and performance relationship. One-fourth of the Meridian 250 (25%) provide voluntary disclosures with alternative measurements of pay based on earned (realized) or projected (realizable) compensation, up from 20% in 2015. Note that these pay disclosures differ from the pay and performance disclosures highlighted on the previous page. Does the company provide a realized or realizable pay disclosure? If so, how is pay labeled? Whose pay is included in the realized or realizable pay disclosure? Is realized or realizable pay compared to pay at other companies? Meridian comment. Among the Meridian 250, the realized/realizable pay disclosures take various forms and may include comparisons to target pay or Summary Compensation Table pay (76%) and/or executive pay relative to other companies (26%). The SEC proposed rule on pay and performance would mandate that companies compare company performance to compensation “actually paid” to the CEO and other NEOs (i.e., a form of realized pay). However, we expect both realized and realizable pay disclosures to continue to grow in prevalence, as companies supplement the required disclosure to further distinguish between an executive’s target compensation opportunity and pay that has been earned or is projected to be earned. Nearly all of the Meridian 250 (96%) impose stock ownership guidelines on their NEOs. The tables below display the guidelines for the CEO, the Highest Paid NEO (other than the CEO) and the Lowest Paid NEO. For companies using a Multiple of Salary structure, what is the average and the most prevalent multiple of salary among the Meridian 250? What is the timing requirement to meet ownership guidelines? 1 Holding requirement in lieu of specific timing requirement (see next page for further details). Hold Until Met—requires an executive to retain a specified percentage of shares received from vested share-based awards or exercised options until ownership guidelines are achieved. Holding Requirement Always in Place—requires an executive to retain a specified percentage of shares received from vested share-based awards or exercised options for a specific period of time regardless of whether ownership guidelines are achieved (e.g., hold for one year post-vesting). Hold Only If In Non-Compliance—requires an executive to retain a specified percentage of shares received from vested share-based awards or exercised options if the ownership guidelines are not met within the allotted time period or if an executive falls out of compliance. Hold Until Retirement—requires an executive to retain a specified percentage of shares received from vested share-based awards or exercised options until employment ends. Does the company disclose the use of a stock holding requirement in addition to or in lieu of a required stock ownership level? How is the stock holding requirement structured? The most common stock holding requirement is the Hold Until Met design. This table illustrates the percentages of “net of tax” shares that must be held by an executive with a Hold Until Met requirement. Meridian comment. The Multiple of Salary approach to executive stock ownership guidelines continues to be the predominant practice across the Meridian 250. The multiple of salary that is required to be held by the CEO has increased modestly since 2011, from 5.4× to 6.0×. The Multiple of Salary that is required to be held for the Highest Paid NEO and the Lowest Paid NEO has remained relatively constant over the past five years. 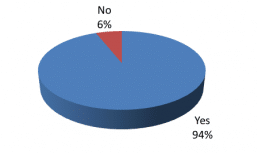 Nearly two-thirds (63%) of the Meridian 250 disclose the use of holding requirements for NEOs. We have seen a steady rise in holding requirement disclosures in recent years, up from 51% in 2013. The Hold Until Retirement design arguably is the preferred practice among corporate governance observers, yet its use remains a small minority practice. Alternatively, the use of a Hold Until Met requirement continues to increase in prevalence. Among companies disclosing a holding requirement, a Hold Until Met policy is used by over three-fourths of the companies (77%). Does the company disclose the existence of an anti-hedging policy? Does the company disclose the existence of an anti-pledging policy? Meridian comment. The disclosure of an anti-hedging policy is nearly universal (94%) among the Meridian 250 and has risen from 57% prevalence five years prior. Based on our experience, the prevalence of these disclosures has risen sharply due to companies either: (i) updating their insider trading policies to incorporate anti-hedging language or (ii) disclosing their previously implemented policies for the first time. In February 2015, the SEC released the proposed rule that will require companies to disclose their anti-hedging policy, if a policy is in place. Although the final rule has not yet been issued, the anticipation of this Dodd-Frank mandate as well as pressure from shareholder advisory groups have been the primary catalysts for the increase in prevalence of anti-hedging policies. The SEC proposed rule does not require companies to implement anti-hedging policies; however, these policies are now considered a governance best practice. A strong majority (83%) of the Meridian 250 now also disclose that an anti-pledging policy is in place, up from 66% in 2014. Of these companies, 83% prohibit all pledging of shares, while the remaining 17% permit pledging of shares subject to approval by the board and/or management or have other restrictions in place. Does the company disclose the existence of a recoupment/clawback policy (excluding Sarbanes-Oxley (SOX) requirement)? Clawbacks are triggered by which of the following? Who is covered under the company’s clawback policy? Which of the following elements of compensation are covered under the company’s clawback policy? Does the Board have discretion to determine whether to recoup compensation once a clawback event is triggered? Meridian comment. The prevalence of recoupment or clawback policy disclosures has continued to rise in recent years. Clawback policies are now disclosed by 93% of the Meridian 250, an increase from 75% in 2011. In addition, disclosure of company clawback policies has become more robust, with companies providing detailed information on clawback triggers, covered employees and applicable compensation elements. In July 2015, the SEC released a proposed rule on mandatory clawbacks, as mandated by Dodd-Frank, which is more rigorous than the typical clawback policy maintained by the Meridian 250. The typical clawback policy permits but does not require companies to recoup compensation upon a triggering event. In contrast, the SEC’s proposed rule would require companies to claw back excess incentive-based compensation upon a triggering event. Further, the SEC’s proposed rule would cover incentive-based compensation that measures the achievement of financial metrics or share price goals, including total shareholder return. Current clawback policies tend to solely cover financial metrics in incentive compensation. While there is currently a wide range of clawback policies among the Meridian 250, companies will need to conform to the new requirements once the SEC finalizes its proposed rule. How many custom “benchmarking” peer groups does the Company use for the NEO population? Meridian comment. Nearly all of the Meridian 250 (96%) disclose the use of at least one custom benchmarking peer group. Companies generally select peer groups based on multiple criteria including: revenues, assets, market capitalization, industry segment, complexity, geographic reach, performance, competitors for talent and investors. Two-thirds of the companies that use at least one peer group have a custom benchmarking peer group comprised of between 14 and 22 companies, with the average peer group size being 18 companies. Peer groups are often used for several benchmarking purposes including executive and director pay levels, incentive plan design practices and run-rate and overhang analyses. In recent years, committees and outside observers have increased their focus on peer groups due to the influence benchmarking studies may have on a company’s pay practices and compensation levels. We recommend that companies annually evaluate their peer group(s) for continued appropriateness, with an eye on the policies and perspectives of shareholder advisory groups such as ISS and Glass Lewis. What corporate financial metrics are used for determining annual incentive plan payouts? 1 Includes EBIT, EBITDA, Operating Income, Pre-Tax Income, etc. A substantial number of companies also incorporate operational/strategic goals and individual performance objectives in their annual incentive plans, typically as supplements to the financial metrics. Are non-financial metrics used to determine annual incentive plan payouts? Meridian comment. Consistent with the 2015 results, the most prevalent annual incentive plan metrics used by the Meridian 250 are Operating Income, Revenue, EPS and Cash Flow. The percentage of companies using each financial measure generally remained constant from 2015, with Operating Income being the only metric that exhibited a slight increase (i.e., from 40% in 2015 to 45% in 2016). Overall, an earnings-based measure (i.e., Operating Income, EPS or Net Income) is the most prevalent type of metric used among the Meridian 250, with over three-fourths of the companies (79%) including at least one earnings-based measure in their annual incentive plan in 2016. If the company uses any of the following metrics, what are the threshold and maximum performance goals (as a percentage of target)? Meridian comment. Threshold and maximum performance goals as a percentage of target remained relatively constant from 2015. In setting threshold and maximum performance goals, the Meridian 250 typically develop a tighter performance range for revenue goals than for other metrics. While market results are informative, the structure of a performance curve is often more strongly influenced by other perspectives, including performance expectations, and industry and company-specific factors. 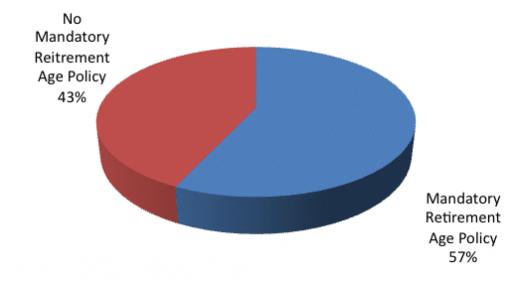 What is the maximum potential payout (as a percent of target) in the annual incentive plan? What is the threshold payout (as a percent of target) in the annual incentive plan? Meridian comment. Consistent with results from the past five years, the most prevalent threshold and maximum payouts are 50% and 200% of target, respectively. However, nearly one-fourth of the Meridian 250 (23%) disclose setting the annual incentive plan threshold payout at $0 (a “First Dollar Plan”). First Dollar Plans often award no payout for achieving the threshold performance goal, but provide interpolated payouts on a straight line basis starting at $1 for performance that exceeds threshold. What LTI vehicles do the Meridian 250 use in their LTI mix? What is the stated LTI mix for the NEOs (based on value)? Does the stated LTI mix significantly differ between the CEO and other NEOs? Meridian comment. Consistent with the results in recent years, the prevalence of each LTI vehicle category indicates strong use of a “portfolio approach.” Nearly one-half (48%) of the Meridian 250 use two LTI vehicles and one-third (33%) use three or more vehicles. Nearly all companies (94%) use a performance-based vehicle, likely in support of a pay-for-performance approach to executive pay. In addition, service-vesting full-value shares (i.e., restricted stock and restricted stock units) (66%) continue to be more prevalent among the Meridian 250 than stock options/SARs (58%). Since 2012, at least one-half of total LTI value has been granted through performance-based vehicles. The relative value granted through stock options/SARs (21%) and service-vesting full-value shares (24%) remained relatively constant from prior year. Although stock options/SARs have been decreasing in terms of total LTI value, a majority of the Meridian 250 still continue to grant these vehicles. Performance Shares—a performance-based award with the same value as a share of company stock that provides a range of potential payouts depending on achievement against goals. Performance Units—a performance-based award that assigns a notional value (e.g., $1) to each unit that is not related to the value of a share of company common stock, provides for a range of potential payouts depending on the achievement against goals and is typically paid out in cash. Performance-Based Restricted Stock/Units—a performance-contingent equity award with no upside payout opportunity (i.e., maximum payout that can be earned is 100% of target). Performance-Vesting Stock Options—a performance-based stock option award that vests contingent on performance and may offer a range of potential payouts depending on achievement against goals. Note: The remainder of this section refers solely to performance-based full value share/unit awards (i.e., not performance-vesting stock options). 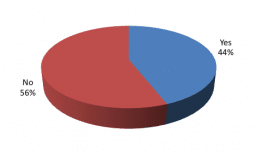 Are the performance-based awards denominated in shares or dollars? Meridian comment. A substantial majority of the Meridian 250 (88%) denominate their performance-based vehicles in shares instead of dollars. Companies prefer the use of shares as a currency over cash for a number of reasons including shareholder alignment, additional leverage, compliance with ownership guidelines and non-cash expense. To determine performance-based award payouts, how does the company set its goals? What types of corporate financial metrics are used for determining performance-based award payouts? Meridian comment. Consistent with prior years, the prevalence of companies using relative TSR as a metric (57%) for determining performance-based award payouts remains higher than the overall prevalence of companies using at least one earnings-based metric (i.e., EPS, Operating Income or Net Income) (47%). How long is the performance period (in years)? If there is an additional service vesting requirement after the performance period, how long is it? Meridian comment. In setting threshold and maximum goals as a percentage of target, the Meridian 250 tend to develop a tighter performance range for revenue goals than for other metrics, with the likely reason being they have less variability. While market results are informative, the structure of a performance curve is influenced by other perspectives, including performance expectations, industry and factors specific to the company. Only 11% of the Meridian 250 require additional service vesting after the performance period. These companies typically have a performance period of one or two years and stipulate an additional service requirement of one to three years. What is the maximum payout opportunity for leveraged performance-based awards (i.e., not performance-based restricted stock/units)? What is the threshold payout for leveraged performance-based awards (i.e., not performance-based restricted stock/units)? Meridian comment. The most prevalent approach among the Meridian 250 is to set a maximum opportunity of 200% of target (66%) and a threshold payout level at 50% of target (43%). Setting a maximum opportunity above 200% of target is not a typical practice and is only observed at a small minority of the Meridian 250 (8%). Although a 50% of target threshold payout is the most common practice, slightly over one-half of the companies (54%) set a threshold opportunity below 50% of target. Does the company use relative TSR as a metric for determining performance-based award payouts (results exclude the use of solely absolute TSR metrics)? If relative TSR is used, are additional metrics used for determining the long-term performance award payouts? If relative TSR is used, what is performance assessed against? If relative TSR is used, is it used as a performance modifier or a weighted performance metric? If relative TSR is used, what is the target performance level as a percentile rank relative to the comparator group (excludes relative TSR modifiers)? If relative TSR is used, what is the maximum performance level as a percentile rank relative to the comparator group (excludes relative TSR modifiers)? If relative TSR is used, what is the threshold performance level as a percentile rank relative to the comparator group (excludes relative TSR modifiers)? Meridian comment. Over one-half (57%) of the Meridian 250 use a relative TSR metric, and of those companies, over three-fourths (77%) pair it with at least one additional performance metric. The most prevalent practice is to assess TSR against a general market index (34%), although comparing company TSR results to compensation benchmarking groups (26%), performance peer groups (24%) or industry-specific indexes (18%) are all reasonably common market practices as well. For companies that use a relative TSR measure, approximately three-fourths (74%) set target performance at the 50th percentile of the comparator group. The most prevalent threshold and maximum performance levels are the 25th and 75th percentiles, respectively. However, 43% of the companies set a maximum performance goal at or above the 90th percentile, requiring superior performance relative to the comparator group to achieve the maximum level payout. Meridian reviewed the corporate governance and incentive design practices of 250 large publicly traded companies (the “Meridian 250”) through the most recently available publicly filed documents (typically proxy statements). Financial highlights of the companies are provided below, followed by a full listing of the companies used in the survey. All figures shown are as of the end of fiscal year 2015. American Electric Power Company, Inc.
Chicago Bridge & Iron Company N.V. The Estée Lauder Companies Inc. The Goldman Sachs Group, Inc. The Hartford Financial Services Group, Inc. The Interpublic Group of Companies, Inc.
Old Dominion Freight Line, Inc. This survey was authored by Jeff Keckley and other consultants of Meridian Compensation Partners, LLC. Questions and comments should be directed to Mr. Keckley at jkeckley@meridiancp.com or (847) 235-3655. We would like to share up-to-the minute industry news and knowledge with you. Meridian provides executive compensation consulting and corporate governance services for publicly traded and privately held corporations. © 2019 Meridian Compensation Partners, LLC.